Product prices and availability are accurate as of 2019-04-23 01:09:35 BST and are subject to change. Any price and availability information displayed on http://www.amazon.com/ at the time of purchase will apply to the purchase of this product. There are a lot of foods you miss out on when you can't eat dairy, soy, gluten, egg, meat, or nuts. For example, what do you dollop on a baked potato if sour cream is off the menu because you can't eat dairy? What do you stir through coleslaw if you can't have traditional mayonnaise due to an egg sensitivity? Additionally, sushi and cold rolls aren’t as fun when you can't have soy sauce. Not to mention enjoying nachos is difficult when you can't eat avocados or cheese. 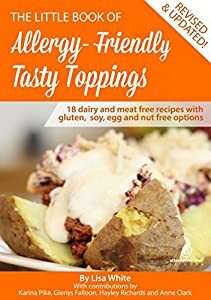 •Four different sour cream alternatives (made with soy, sunflower seeds, cashews, and one very untraditional option made with butter beans). •A soy-free cold roll/sushi dipping sauce alternative. •Some tasty toppings for tacos and baked potato including a simple salsa, two guacamole options, easy-to-make taco seasonings, and raw BBQ onions. •Four mayonnaise alternatives (a traditional egg mayonnaise, one with chia seeds, an avocado option, and one with hemp seeds, cashew, or macadamia nuts). •Lastly, some tasty simple salad dressings that are also yummy on steamed veggies. The book has a detailed "Extra Resources" section and video footage to support the recipes. Furthermore, beginner free-from cooks will benefit from a comprehensive list explaining the less common ingredients and where to buy them as well as descriptions of the techniques used to help turn the foods you "can eat" into foods you "want to eat."